l-r: Steven Ricke and Dale Thompson. FAYETTEVILLE, Ark. 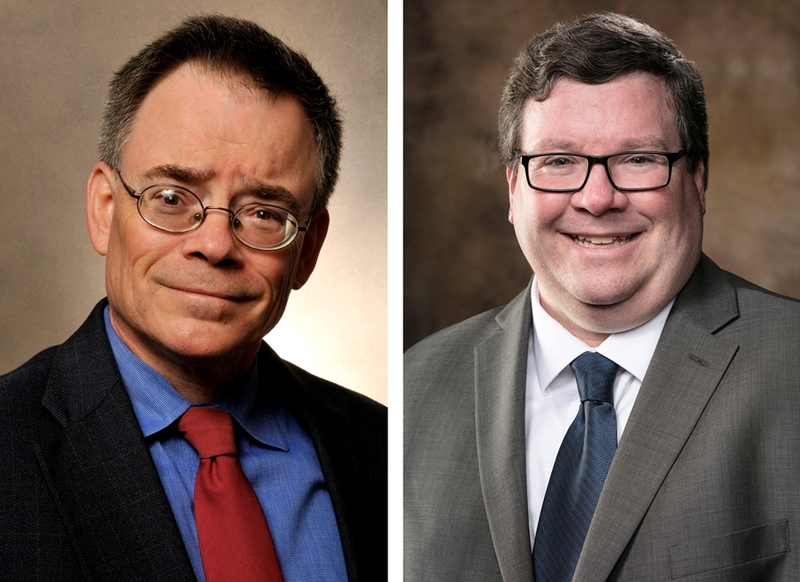 — Two Arkansas researchers have received a grant to train food science cybersecurity professionals to protect the increasingly automated food industry from cyber attacks. Steven Ricke,holder of the Donald Buddy Wray Food Safety Endowed Chair in the department of food science and director of the University of Arkansas System Division of Agriculture's Center for Food Safety, and Dale Thompson, associate professor in the College of Engineering's department of computer science and computer engineering, received the grant from the U.S. Department of Agriculture's National Institute of Food and Agriculture. The two-year grant establishes the Food and Cyber Education project, or FACE, to prepare food science graduates to protect U.S. food systems from cyberattacks. The project is conducted by the Arkansas Security Research and Education Institute, also known as the ASCENT Institute, in partnership with the Center for Food Safety. Ricke and Thompson, along with engineering faculty Chase Rainwater and Jia Di, are co-founders of the ASCENT Institute. It conducts research in cybersecurity, transportation security, infrastructure security and food security. Thompson said FACE will determine the interests, perceptions, and understandings of food science cybersecurity jobs and cybersecurity topics and develop a curriculum to train graduate students in food science to keep the food supply safe from cyberattacks. The curriculum material will eventually be based on existing courses, Ricke said, but in the immediate time frame will likely add special problems for students participating in the FACE program. Ricke said FACE eventually will be offered to students in both the Dale Bumpers College of Agricultural, Food and Life Sciences and the College of Engineering. He added that the program will likely be extended to undergraduate students as it develops. As food industries continue to automate their systems to monitor food safety and create more efficient production, Ricke and Thompson said, there are fears that attackers will gain access to those systems, gather information and attack the country's food supply. "The food system industry will continue placing sensors from the farm to the fork to make our food systems more efficient and safe," Thompson said. Thompson said the growth of networked food safety and production systems adds to the "Internet of Things," the network of physical devices, including vehicles, machines and other devices embedded with electronics and software and connected to the internet. Also called the IoT, the system provides efficient computer-based systems, but also opens them to cyberattacks. "We anticipate that federal regulatory agencies will require automated inspection for quickly identifying and preventing contaminants in the food supply chain," Thompson said. "Just like the internet, this future food system sensor network could be attacked." Ricke said, "Advances in foodborne pathogen whole genome sequencing methodology and food microbial community microbiome profiling have resulted in an explosion of large data sets which require not only much more sophisticated analytics but protection of the data from outside threats." "This grant will lead to a food science student entering the food industry being much more aware of these threats and better equipped to anticipate them before they occur," Ricke said. About the Division of Agriculture: The University of Arkansas System Division of Agriculture's mission is to strengthen agriculture, communities, and families by connecting trusted research to the adoption of best practices. Through the Agricultural Experiment Station and the Cooperative Extension Service, the Division of Agriculture conducts research and extension work within the nation's historic land grant education system. About the College of Engineering: The University of Arkansas College of Engineering is the largest engineering program in the state of Arkansas. The College of Engineering offers graduate and undergraduate degrees in nine engineering fields, as well as incorporating distance learning and interdisciplinary programs.